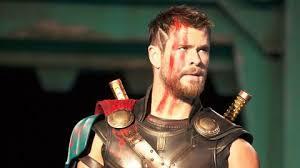 In this latest in the Marvel Studios offerings,Thor: Ragnarok," Thor is imprisoned on the other side of the universe without his mighty hammer and finds himself in a race against time to get back to Asgard to stop Ragnarok--the destruction of his homeworld and the end of Asgardian civilisation--at the hands of an all-powerful new threat, his sister, the ruthless Hela. I can't say that I was too enthralled with the prospect of yet another superhero movie to digest as it has been a long and at times weary feast of superhero blockbusters over the past year. Incredible special effects and dazzling CGI can only thrill for so long and after a while these type of films tend to blend into each other and are easily forgettable. Mercifully, Thor:Ragnorak is not one of those films and thanks mainly to this chapter in the series being captained by the wonderful New Zealand director Taiki Watiti. Anyone familiar with Waititi's previous work which included Hunt for the Wilderpeople and What We do in the shadows will now that his sense of humour and comic vision are his strongest assets and Thor: Ragnorak has his unmistakable mark all over it. In fact, this latest Marvel offering contains more laugh out loud moments than any comedy I've seen on the big screen this year with the cast obviously having fun in their roles too. Casting in this film is very strong also with old reliables Chris Hemsworth, Tom Hiddlestone and Idris Elba bringing their usual charm and charisma to the production but it is the cameo additions including the always solid Cate Blanchett and the unique Jeff Goldblum (doing his best Jeff Goldblum impression!) that elevate this to another level. The visuals in this big budget feature are also noteworthy with the explosion of colour throughout almost resembling an advertisement for skittles but that combined with some incredible effects (accompanied by Led Zeppelin's rip roaring Immigrant Song ) all hit their mark successfully. This concoction of humour (and the fact that unlike lots of films in this genre it never takes itself too seriously), a reliable cast and incredible special effects combine to produce one of the finest superhero films this year with Marvel Studios delightedly leaving the best until last! Highly recommended!